Little People. 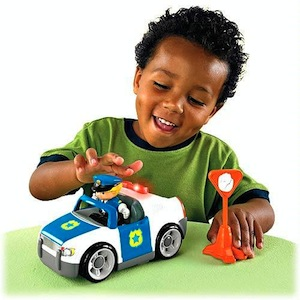 When Police Officer Eddie™ gets a call, it's lights & sirens time! He's off in his cruiser to the rescue scene! Whether he's saving a kitty stuck in a tree or straightening out a traffic jam, you can count on Eddie to help kids learn about community helpers as he saves the day! Requires 2 AA batteries. Car approx. 9½" L.